Status epilepticus (SE) is a state of continuous seizure without return of consciousness. Any seizure type can progress to status epilepticus. Status epilepticus is a serious medical and neurological emergency which requires efficient management as delay is associated with worse outcome. The prognosis depends predominantly on the cause and duration of the SE and is good in rapidly reversible causes. Overall mortality is 15.8 %. 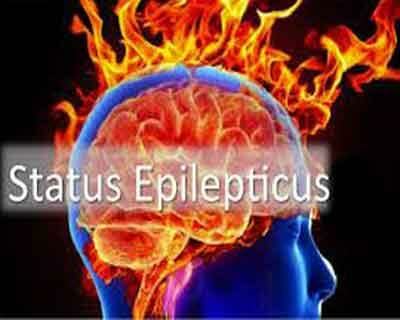 Additional 10 to 23% of patients who survived from status epilepticus are left with disability. Ministry of Health and Family Welfare has come out with the Standard Treatment Guidelines for Status Epilepticus. Following are its major recommendations. Clinically definition of SE is based on manifestations of continuous seizure activity and incomplete recovery of consciousness between seizures for a ‘particular duration’. The criterion for duration is still ambiguous and evolving issue. For all practical purposes, a patient should be considered in status epilepticus if seizure activity lasting more than 5 minutes as very few single seizures will last this long. Refractory Status Epilepticus (RSE): Appropriate definition is still not available. RSE is commonly defined as seizure activity that continues after failure of first and second line antiepileptic drug therapy (AED) therapy. Chin et al in a recent systemic review reported incidence rates of SE between 3.86 to 38 per 100,000 per year in children and 6 to 27 per 100000 per year in adults in Europe. Incidence has bimodal distribution with peaks in children less than a year (135 to 156 per 100000 per year) and elderly (14.6 to 86 per 100000 per year).The annual incidence of Non convulsive status epilepticus (NCSE) is 2.6 and 7.8 per 100000. NCSE was documented in 8 % of all comatose patients without signs of seizure activity. Frequency of refractory status epilepticus in patients with SE ranged from 31 to 44 %. There is hardly any incidence data available in India. In a recent study NCSE was documented as a cause of altered mental status in 10.5% of comatose patients without signs of seizure activity. The incidence of RSE in SE patients in Indian series ranges between 12 and 19 %. Disorders that may mimic seizures are benign conditions like myoclonus, fasciculations, tremors, tics, panic attack, psychogenic seizures and potentially dangerous conditions like basilar artery transient ischemic attack, metabolic encephalopathy and syncope. When doubt regarding diagnosis is present one should always request neurological consultation and electroencephalogram (EEG). Video- EEG monitoring may be useful for detection of ongoing subclinical seizures and should be considered in critically ill patient with unexplained altered mental status. CSE is the most common form of SE characterized by rhythmic jerking of the body, limbs, tongue biting and loss of consciousness. With increasing seizure duration the movements may become reduced although generalized electrical activity continues in the brain. NCSE may be difficult to diagnose and may be more common in the elderly population. Although there is no accepted classification of NCSE, two major types are partial complex –which is subdivided on the basis that whether the patient has underlying epilepsy or is in coma and petit mal. In partial complex SE stereotypical movements such as lip smacking, chewing or picking at ones’ clothes may occur and alteration of consciousness lasts more than 30 minutes as result of abnormal cortical electrical activity. Physical examination should look for signs of occult head trauma, substance abuse, fever, meningismus and diabetes. Always check for Medical Alert bracelets or wallet information and try to contact relatives to determine prior medical and seizure history. Adequate venous access and liberal hydration should be started with normal saline to prevent dehydration and rhabdomyolysis. In the setting of acute brain injury, treatment usually should be initiated after a single self limited seizure. Initial AEDs (viz. Lorazepam and phenytoin) should be given as soon as possible. Management of SE should begin within 5 minutes of seizure activity or after two seizures without full recovery in between. Patients of SE can be considered for transfer to superspeciality center if seizures are not controlled with benzodiazepine and first line antiepileptic drugs or patient has recurrent seizures after initial stabilization. CT or MRI scan and lumbar puncture may be necessary to establish underlying diagnosis once seizures are controlled. NCSE can only be diagnosed by EEG. Give Phenobarbital 10-20 mg/kg IV at <70 mg/min. Valproate 15 mg/kg IV load may be useful as an adjunctive agent.